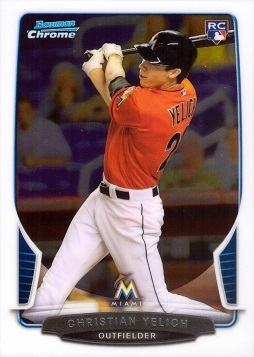 This is an original, authenitc baseball card of Christian Yelich produced by Bowman Chrome Draft Baseball in 2013. Bowman Chrome Draft cards are made by Topps. In the upper right corner region of the card you will see the official RC logo, incdicating that this is a true Rookie Card.